In the Chicago area, from which I hail, eggplants grew well in the deep black topsoil of the area. Back then I only grew the black beauty types and never really did any experimenting and was satisfied with what I got. Since moving out to Western Illinois, I tried to grow eggplant for several years and have had no luck. Flea beetles and other pests, as well as soil that wasn’t accommodating to eggplant production, took a toll on my eggplants. In the past couple of years though, I have added a hoophouse to our farm, as well as manure and other amendments to the soil. After these adjustments the eggplants are growing great! The hoophouse seems to keep most pests away and the eggplant production skyrocketed. I had a bumper crop last year. I took advantage of this change and started to grow many heirloom varietes. Among the heirloom eggplants I am growing is the Louisiana Green. I have never tried this variety before and according to High Mowing Seeds, the Louisiana Green has similar flesh and skin as Oriental types but meatier with a full flavor. Slow cooking or braising will bring out the flavor.Tall, vigorous plants produce slender 8-9” long fruits that are glossy and lime green. 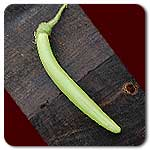 Plants benefit from support producing elongated and straight fruits. Even though the appearance of the Louisana green might make you think that it is an oriental type, it was actually bred in the US. I am now starting to get some small fruits on the plants and I will let you know the results after I harvest some. What’s up, every time i used to check blog posts here early in the daylight, since i love to learn more and more. Thank you for reading the posts! I haven’t been blogging in a while but I am starting to get back into it now. browsing this web site dailly and take nice facts from here all the time.